I opened the cabinet on Saturday to get out a dishwasher tab, so I could start the dishwasher. The bag was empty and there was absolutely no money left in the budget for anything else. I was thinking about taking all the dishes out and washing them by hand when I remembered a DIY recipe that I had printed months ago and never tried. I'm so glad that I had bought some of the basic ingredients to make homemade cleaners, a few at a time, when I did have some money. So I had everything on hand, thank God. One of the ways I save money is by making my own household cleaners. I stopped buying cleaners years ago. I hated breathing the harsh chemicals, they didn't work that great anyway, and were way more expensive. So I called the girls into the kitchen for a project. It really didn't take long to mix up, maybe about 5 minutes. 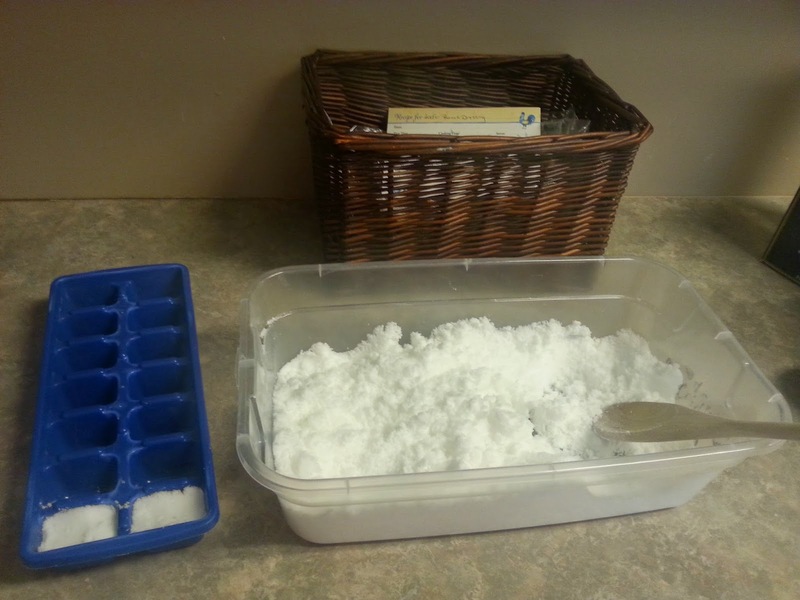 The most time consuming part was packing it down into the ice trays. Which won't really be that time consuming for those of you who are not OCD, like me. Most of these recipes I found online and this one is no exception. Go here to see the recipe and to try it yourself. Let me know what you think. Do you already make your own dishwasher tabs? I'd love to read about your experience with homemade cleaners. Surviving During a Job Loss. Over the years I have tried many different things to save money. Right now on our journey it has become not only a need but necessary for our survival. I know that sounds sort of harsh, I feel like we are in survival mode right now. My husband had worked for the past ten years hauling mail for a contractor. Well back in May they told them that they were taking all the contracts and bidding them out to two big companies, even though the contract wasn't up for two more years. My husband had been driving an hour and a half to work and was working long hours. He could have applied with the new company but it was gonna pay less plus the post office was gonna cut the route. We were already having a hard time since it took so much in gas just to get to and from work. We decided to look for another job. His job ended June 30th, he finally got a temporary job on July 3rd. I say temporary because it pays so little that we have to find something else and he and the employer aggreed that he would leave as soon as he found something better. We already had a lot of bills. This has been maybe one of the hardest times on this journey. I would love to be able to say that we were debt free and that we just cut back but that is not the case. We already lived very frugal, (I thought.) I never spent money on things like getting nails done or expensive name brand items. However when you have an income change like this you realize many other things that you can live without. Now I know you must be wondering, if things are so tight then how do you have Internet. We did cut out every possible bill that we could. However, we felt like if at all possible we neeeded to make the Internet a priority. So that I could work from home. I'm looking into an Esty store to sell my crocheted flower hair bows, and hairbands. So I plan to share some of the frugal tips that I have used. Sometimes I have tried things that just didn't work or I couldn't really see the savings so I ditched those. Sometimes I tried things that might have worked over time but I just couldn't stick with it. (I am human.) A few of these things I have been doing for a long time and some I just tried last week for the first time. All of this has helped but the main thing that has kept us through this is Jesus. A lot of prayer and a few people that he has sent to bless us. Now that doesn't mean we were still able to get what we wanted or to go anywhere. We have not been ANYWHERE all summer except to church and the grocery store. There is a very important event coming up in our family that at this time it looks like we will miss. Right now we are still having faith that our circumstance will change in time. If we miss the event yes we will be sad but that doesn't mean God is not still taking care of us. He says in his word, "For my thoughts are not your thoughts, neither are your ways my ways, declares the Lord. As the heavens are higher than the earth, so are my ways higher than your ways and my thoughts than your thoughts." Isaiah 55:8-9 So even though we will not like it, if we have to miss the event, God may have a reason that we do not understand. I am still believing that it will all work out. I would rather do without than have someone else teach and spend the day with my kids. I enjoy being with my girls, even on the hard days.